Ecclesiastes 3 (and the Byrds song) tells us that there is a season for everything in life. If you can imagine it, there is a time for it to happen, good or bad, joyful or depressing. The range of emotions that we encounter in a lifetime is nothing short of awesome, and I don't mean that in the 1980s 'totally gnarly, awesome, radical, man' kind of way. I mean, we should be in awe of it, truly. Like a rainbow where there are just a few basic colors but an entire world created of blends of those colors, so are emotions. There are shades of happy, shades of angry, shades of sadness. Right now I am feeling a very distinct blend of joy, sorrow, and hope. Our son is graduating from high school tomorrow afternoon. He, himself, has run the gamut of emotions this year, most especially in the past month, for a myriad of reasons. 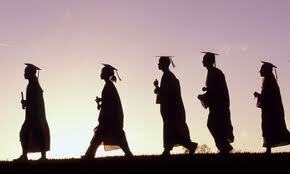 Graduating is a happy occasion, it's true -- but it's also a fearful occasion. So much that you knew before is over: waking up at the same time five days a week, seeing familiar faces you've known your entire life on a regular basis, picking your meal and eating off of a tray, being in a band or choir or club -- the list goes on and on. Granted, there will be versions of this in little flashes throughout your life. Getting up the same time every day for work is different than it is for school. Eating off a tray at McDonald's is different than being surrounded by 200 people you've known for so long, in the same room, laughing and goofing off and getting ready for your next class. The reflections of high school will last forever, but this time, this moment... it's over. I have spent so much of my own life waiting for the next moment. This is a subject I've brought up before, so its no doubt a bit old hat by now, but I want to continue warning people not to get stuck in this rut. When I was little, I wanted to be older like my brother so I could go out with my friends whenever I wanted to. When I was in high school, I just wanted to get away from there because I lived in misery most of the time. When I was single, I couldn't wait to be married, and when I was married the first time I couldn't wait to be single again. When I lived in Niles, I couldn't wait to get out of there, and when I lived in Ann Arbor, I couldn't wait to get home. The problem with this mentality is that now, I look back on everything I "couldn't wait" to do, and I am hit with the stark realization that I should have waited. I should have tried to postpone so many things for as long as I could, because there are times in your life that you will not get back. I will never have recess again. I will never learn how to drive a car again. I will never stand on the gymnasium floor and play 'popcorn' with the parachute again. I will never have a first kiss again. I will never live in my parents' home again. I will never be in a building with the 92 other people I graduated with again. On the surface, there are positive and negatives to all of these statements, but the rush of emotions that each one of them conjures up is something that I will only ever again experience in memories. I look at where I am in life right now: a small town in Indiana, working three to four jobs on a weekly basis, and waiting for the next milestone in my life. Whether it's moving to Las Vegas, or having a baby, or writing something that really sells, I'm waiting for it. But I've learned some things along the way. I'm not pushing *this* moment aside while I wait. I'm living in the season of life that I am in, enjoying the clip-clop of the horses that carry the Amish buggies down our county roads right here in Middlebury, being able to see the stars so clearly every night, having fun with our teenagers instead of constantly changing diapers and having sleepless nights, directing theatre and working with my husband, and holding hands on our second-hand sofa while we watch the biggest TV we can afford, all 32 inches of it, in our living room at night before we fall asleep exhausted and tackle the next day together. I've finally learned to cherish this season while I'm waiting for the next instead of suddenly looking around and wondering where it went someday.